Kaely: I think it’s only fitting that we start with the animation heavy-hitter--Disney’s Big Hero 6. For those of you who are new to the podcast, you can hear our full review on our first episode here. I think Disney has come a long way and is going back to its roots of fantastic storytelling. It felt like it had fallen off the horse, sort of speak, until they acquired Pixar. But even then, Pixar was blowing them out of the water. At this point, the two studios seem to have integrated in such a way that they are both doing quality films. And it really shows with Hero. Lulubell: Big Hero 6 was a joy to watch, and like you say, Disney has come back to good storytelling. Making compelling characters that are complex and relatable. The main character--Hiro--lives up to his name. He’s a young boy going through a painful ordeal and has to decide whether he wants to become a hero or take the easy way out. That’s something many of us not only as kids but as adults have to go through. It’s one of those movies that has a great message and melds the cute, funny and animated with a powerful message. Kaely: I couldn’t have said it better myself. In fact the blend of American and Japanese tastes is brilliantly evident in this film. I got a huge kick out of San Fransokyo. They really hit the mark with that one--particularly when you consider how huge anime has gotten in the US. What with Pokémon and Naruto, and even Attack on Titan, J-animation (if you will), is huge here in the US. I think that creative blend is something that the judges are going to really enjoy. Lulubell: That melding of culture was perfect. It was very realistic and true. Culture in real life melds and molds itself like that. Kaely: And like you touched upon, the story is incredibly strong. It’s something that audiences can identify with--loss, struggling to find your place in life, revenge, forgiveness. These are very real emotions. In the end I know I teared up a bit. So I think this film will be a strong contender for the win. But then there is How to Train Your Dragon 2. Now this film took the prize at the Golden Globes--much to my astonishment. While I enjoyed the movie it lacked the pizzazz of the first one. And the jokes. Not as many good jokes this time. Lulubell: I didn’t like this one at all. It was not like the first, which I really enjoyed watching and it felt new and fresh. This second one suffered from the dreaded sequel curse, which is that it totally sucked! There was nothing new to it and even the character of Hiccup, changed. His character arc from the first took a step back in this one. There was nothing really new or necessary to add to the story. Even the mom coming into the picture wasn't enough to save the story. Kaely: The story was weak, which is upsetting because the first one was so good! I feel like the writers were trying to grasp at plausible plots. Plot 1: the dragon hunters, equaling a new “threat” to Berk. I think that might have been brought on because of the subsequent TV show. But apparently that wasn’t good enough, so they introduce the whole missing mother plot. They didn’t develop either one very well. Lulubell: The mother plot felt forced and a cliche. Then what they did to the dad after they reunited...gah! I hated that. It was completely unnecessary. Kaely: Agreed. However, the animation was still good. It ticks the box for visually stunning. But that couldn’t save the film. Honestly I’ll be furious if this one wins the Oscar. Lulubell: So will I. One movie that I hope wins--and that’s only because I haven’t seen the last two we will talk about--is The Boxtrolls. I was pleasantly surprised with that one. The animation has the Gumby feel to it. I LOVE that kind of animation. Similar to that of Fantastic Mr. Fox. Stop motion is hard to pull off, and though this one is computerized it doesn't make it any less cool. As for the story, this one felt new to me, though the story of a boy growing up with a separate family and not knowing the truth is not a new concept, the execution of this felt new, and the characters are endearing. Kaely: The people behind this film are the same ones who created ParaNorman and Coraline. Both of those films have, what I like to call, the “Tim Burton look.” These aren’t light fluffy films. They are a bit dark, both in story and in color palettes. It gives them a definitely unique look. I actually watched this film on a plane! But it’s charm was still evident over the blaring white-noise of flying. The neat thing about stop animation these days is that it is actually really good! It’s come a long way since the days of Nightmare Before Christmas. And it’s this kind of animation is always a sure-fire golden ticket to an Oscar nomination. The Academy loves stop-motion. Lulubell: It does have that Tim Burton feel! And you’re right about it being dark. There’s a certain appeal to it being just a bit strange, but having a knack to entertain. Not to mention that the black comedy in it is fantastic. Even the drag queen was awesome! I mean who would think to put that in a kids film!? Kaely: Haha! Right? Animation pushes so many stereotypes and taboo subjects with ease that can’t be had in live action--at least in my opinion. And I think its the dark tone which makes audiences love stories like this. It harkens back to the traditional fairy-tale foil where there were severe consequences to actions. I mean the trolls were enslaved--and the hero, Eggs, is nearly killed in quite a gruesome way. But it is no less charming. My favorite part was actually at the end, during the credits, where two “reformed” bad guys are literally cleaning the streets and they have an existential conversation. “What if someone is behind all this? Controlling our actions?” And then the camera pans out so you can see the animators. Lulubell: Hahaha. Those two “bad guys” are fantastic. I love that their form of speech is much higher than it should be, and that they are aware that something is wrong, but not enough to make them change until the end, when they are in essence absolved of their sins because they save Eggs. What I liked the most was the fact that Eggs, though he was a hero, it wasn’t him who saved the boxtrolls. They chose to save themselves. Kaely: I would actually be delighted to see this film win, but it would be my second choice. My top pick for animation would have to be the Irish film Song of the Sea. This came out of the same Irish animation house as The Secret of Kells. And like that film, Song of the Sea has utterly gorgeous animation. What I find compelling about this film and it’s predecessor, is the fact that the animation is actually quite flat, but there is so much texture and detail in each scene. Irish motifs are everywhere, from the spirals, to Celtic knot work. Also I love how they incorporate traditional Irish ballads into the story. In fact, music is hugely important in this film. Lulubell: I haven’t seen this film, but I have seen The Secret of Kells. That animated film was gorgeous. It had such beautiful animation and beautiful colors and the music felt like it had been written for the story, in the sense that it felt like it was born from the story. From the trailer of this one, it seemed the same. Kaely: I’m not entirely sure if the song the main character, Saoirse, sings is original to the film or not, but I can say that there are a lot of traditional Irish songs inserted into this film. And for me, having grown up listening to this music, I was just utterly delighted to hear it in the film. The story itself is based off of the Celtic myth of the selkie--a mythical creature that shape shifts between seal and human. When they become human they shed a coat. If a human captures the coat the selkie is bound to that person--but they always long for the sea. In this story Saoirse is the last selkie in the world. She and her brother have to escape the big city so she can return to the sea. Along the way they meet all kinds of fairies and creatures that are familiar to those who grew up with these stories. But for those who don’t know them they are introduced in a way that is easy to grasp. I think overall, this story ticks all the boxes for storyline, animation style, and music. It’s certainly more approachable than the other folk-tale nomination, in my opinion. Lulubell: You mean The Tale of Princess Kaguya? Kaely: Yes. Now this film is also very good. And for those familiar with Japanese myths, you’ll really appreciate this movie. It’s based off of a 10th century Japanese fairy tale about a Moon Spirit, or nymph, who wants to discover what it’s like to live in the human world. Throughout the film it becomes clear that living on the moon is paradise--only happy feelings exist there. That being said, there’s a whole range of emotions that the moon spirits never get to experience, like sadness, anger, loss. Kaguya comes down and is born from a bamboo shoot. A farmer finds her and he along with his wife raise her. They live a pastoral life of bliss until the farmer decides that his “little princess” is deemed for higher things. This comes about after he discovers gold dust and fine clothes in the forest for Kaguya. So in short, they move to the city, Kaguya has many suitors, all of which she snubs--including the emperor. However, she is eventually discovered by the rest of the moon people and has to return. Once she is taken up her memory is wiped clean. The only thing she has left is a residual feeling of melancholy when ever she looks down on the earth. Lulubell: That sounds really interesting, but the execution for that kind of film has to be very precise. It’s a story we’ve seen a semblance of in other films and one that may not be that appealing to most. The ending alone, which suggests a cyclical story style, is probably not one that us Westerners are very used to. Kaely: This film was not for me. My biggest complaint was that it was excessively long. Or at least it felt that way. But if I remember correctly the film was almost three hours--which is very long for an animated film. It’s pacing was slow and kind of disconnected. I think the writers were trying to stay very true to the original myth--or at least that was my take away. In fact this film had a very particular style. It was modeled after a specific style of Japanese painting. It has a watercolor look to it, but then it has this feeling of been unrolled, like a scroll. It was beautifully drawn. Interestingly enough, this film was produced by Studio Ghibli, but its look was its own. Lulubell: That’s interesting. I’ll have to watch it to see what you mean. So from our nominees I would choose The Boxtrolls. But honestly, if I had a choice it would be another movie altogether, and actually I’m kinda upset this movie was not nominated. That animated movie is: The Lego Movie. Why?! Why was this not nominated?! This is the biggest snub this year in my opinion. Kaely: I have to agree. In fact I had to know why it wasn’t nominated so I did a little bit of research. Apparently, this film didn’t have the artistic direction or story line that the Academy likes. I read in one article that the animation essentially parodied stop-animation but didn’t require the same amount of effort. So that right there is a losing quality--apparently. Also, the jokes and puns are not the Academy’s style. And remember, the Academy doesn’t give dime when it comes to what was the most popular or highest grossing film. That being said, I still think it was a fail to not nominate this film. It should have taken the place of How To Train Your Dragon 2. Lulubell: Precisely! How is it that they take a crappy, incoherent storyline that is Dragon, but fail The Lego Movie because it didn’t take the same amount of effort? What crap is that!? I’m sure the effort was on par with some of the others. I mean what kind of work were they thinking they did? I thought that the snub came perhaps because there is live-action at the very end. But even then, it was a new story and a great animation. They should be given credit at least for that. Kaely: It was definitely one of the biggest snubs this year for sure. 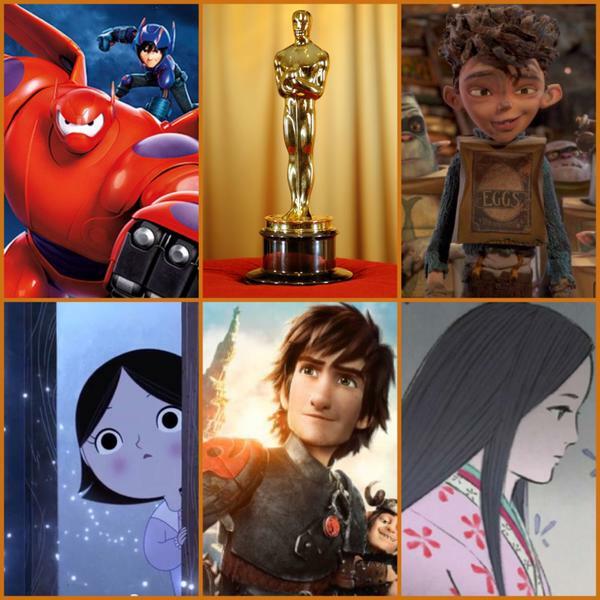 But when it’s all said and done I think the Academy will choose Big Hero 6. It’s safe and meets all the nebulous qualifications they look for. But if I had a say, I would give it to Song of the Sea. Lulubell: Well, we will see how it goes on Oscar night. Kaely: Speaking of which--are you going to make a party out of it Lulubell? Lulubell: You bet! I’ll be watching it on my TV with a bowl of popcorn in hand. You? Kaely: Honestly, I’m the type who just waits for the results, but I think this year I’ll make an exception. Haha! Lulubell: That’s it folks. What did you think of the nominations? Who do you think will win? Thanks for joining us for this Oscars Special!